The bite of a blue-ringed octopus is one of the deadliest the world has to offer — and it comes in an ounce-sized, squishy, package. 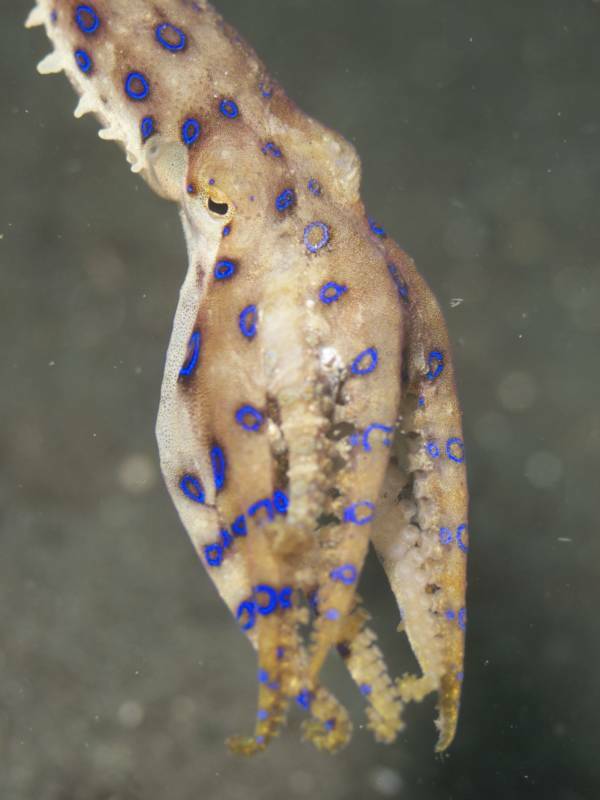 PixabayA single blue-ringed octopus bite can cause paralysis and death. The blue-ringed octopus, though tiny, packs a lethal punch. Despite being absolutely adorable, it is one of the deadliest animals in the world. The little cephalopod doesn’t have razor-sharp teeth or even the ability to travel particularly fast, but it does produce a paralyzing neurotoxin that can leave unsuspecting company paralyzed — or dead. Characterized by its blue and black rings which appear when the animal feels threatened, the seemingly harmless mollusk possesses a venomous neurotoxin, known as tetrodotoxin, which it releases through its salivary glands. Technically, all octopuses and cuttlefish are venomous, but the blue-ringed octopus can’t be compared. Tetrodotoxin is 1,000 times more deadly than cyanide and the amount of poisonous liquid the little cephalopod carries can mean certain death for up to 26 people, or leave someone paralyzed for up to 24 hours after initial contact. Worse yet, there is no known antidote. A victim’s best bet is to get respiratory assistance immediately. Of course, the animal’s ability to produce and secrete the venom is only one of its interesting characteristics. Indeed, the blue-ringed octopus’ hypnotizing appearance and dangerous internal functions are only half the story. PixabayA blue-ringed octopus perching atop coral in Bali, Indonesia, 2016. It may not come as a surprise that this deadly creature is most prevalent in Australia. Though the blue-ringed octopus dwells all over the Indo-Pacific Ocean, it’s particularly common to the land down under’s southern region. The mollusk, known scientifically as the Hapalochlaena maculosa, is less than five inches in diameter, weighs a mere ounce, and has eight flexible arms at its disposal. Though it’s the salivary glands that produce the fatal, paralyzing neurotoxin, the substance is distributed across all body parts, particularly the arms and stomach. Their eight arms are covered with suction pads like most other octopuses. These blue-ringed ocean dwellers have a pretty short lifespan. From pea-sized babies to an adult ping-pong ball, the octopus usually survives no longer than three to four years. Blue-ringed octopuses are in the cephalopod class of mollusks because they have a soft and sack-like body that is reminiscent of snails and slugs. 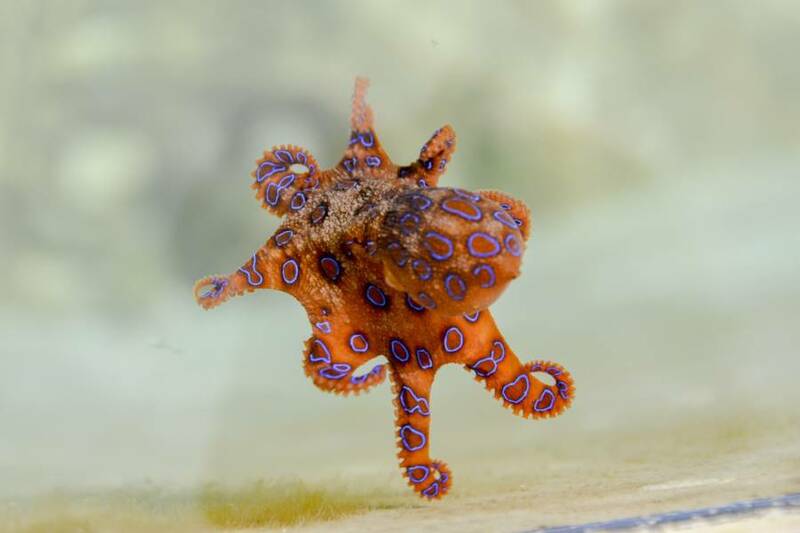 Because the blue-ringed octopus doesn’t have a protective layer to help it survive, some argue that they instead developed an impressive display system of iridescent rings, strong flexibility of the arms, high sensory systems, and a notable brain size. Like other octopuses, too, this little mollusk has a tiny beak for a mouth hidden away until it is time to feed. Wikimedia CommonsA blue-ringed octopus in West Papua, 2014. 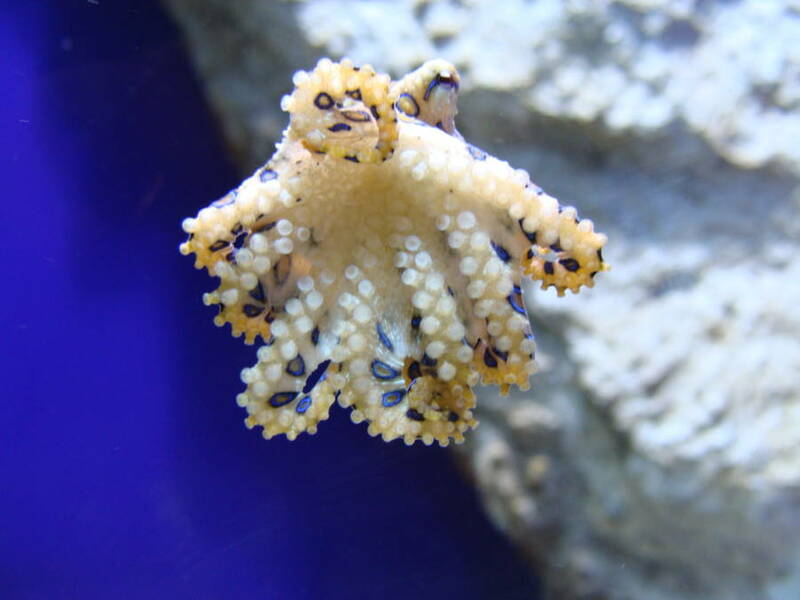 The neurotoxin, tetrodotoxin, is also found in pufferfish and is used by the octopus for hunting. 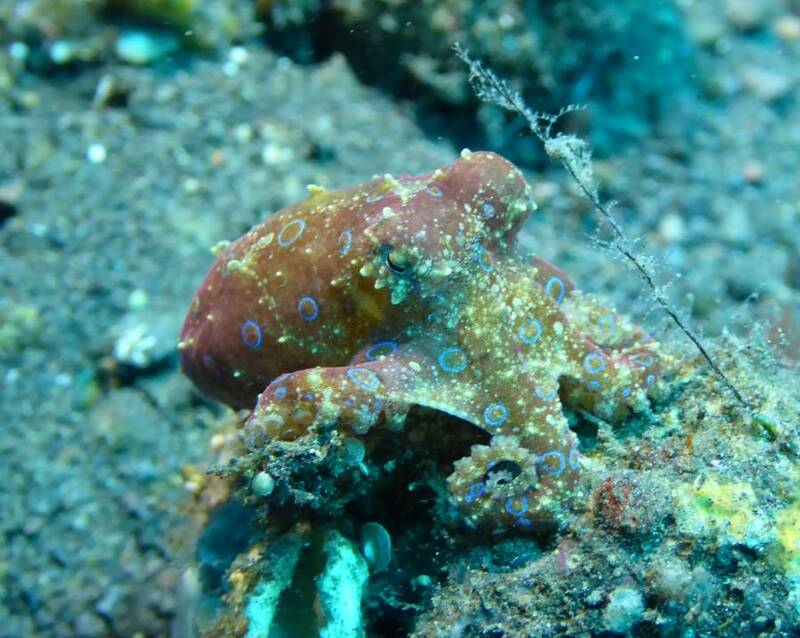 While human beings unlucky enough to experience a blue-ringed octopus’ poison have it rough, marine life has it worse. Once the prey has been identified — whether it be crabs, shrimp, or fish — the octopus has to crack through its exoskeleton. Once that protective layer has been permeated, the octopus secretes its venom into the animal’s bloodstream. Eventually, the prey will go numb, and then be paralyzed. This allows the octopus to eat its victim freely. If you happen to find yourself in the unlikely yet possible scenario of surviving initial exposure to the animal’s tetrodotoxin, you’re in for a lengthy, terrifying ride. First, the venom will cut off your nerve signals and numb your muscles, and then you’ll experience complete paralysis. Wikimedia CommonsA blue-ringed octopus in the Aquarium Finnisterrae in Spain, 2008. These symptoms are traumatizing enough but don’t even comprise the entirety of a blue-ringed octopus’ effects on a human victim. Vision loss, extending into blindness, could follow. Your motor skills are inhibited, before ultimately becoming useless when you can no longer move, at all. You won’t be able to smell, touch, taste, or hear. On top of that, you won’t be able to swallow. Ultimately, it’s the muscle paralysis that’ll kill you — the heart is a muscle, after all. Without the blood-pumping organ functioning as intended, your lungs won’t receive the oxygenated blood they need to do their job. Thus, respiratory arrest follows, with your last known contact on Earth being a small, seemingly harmless octopus. There have been cases, of course, that prove to be exceptions to the rule. 49-year-old Anna Van Wyk was unlucky enough to be poisoned by a blue-ringed octopus in Australia but fortunate enough that emergency crews knew to induce artificial breathing as soon as possible. A toddler playing with his brother in the shallows of an Australian beach fell victim to the bite of a blue-ringed octopus, too, and spent the night on life support to help him breathe through those crucial 24 hours of neurotoxicity. As you may have noticed, both of these cases occurred on the one continent where exposure to this species is common. As Reddit user Delamoor described in a popular thread, the poison of a blue-ringed octopus is so debilitating to the human body that an emergency responder has to be cognizant of more than just the victims’ breathing when treating them. Delamoor recounted an anecdote from a teacher who had performed CPR on a blue-ringed octopus victim. He did so until emergency services arrived on the scene, but the first responders were so busy saving the person’s life by prioritizing respiratory function, that they forgot to shield the victim’s eyes — which had been paralyzed, open, and staring into the sun for hours. Our co-existence with the blue-ringed octopus has been largely amicable, despite its unparalleled ability to murder things without much effort. The Ocean Conservancy even reported that not a single death by a blue-ringed octopus has occurred since the 1960s. The blue-ringed octopus has garnered renewed attention on social media and publications alike as an uninformed tourist in Australia captured his miraculously harmless encounter with the animal on video. 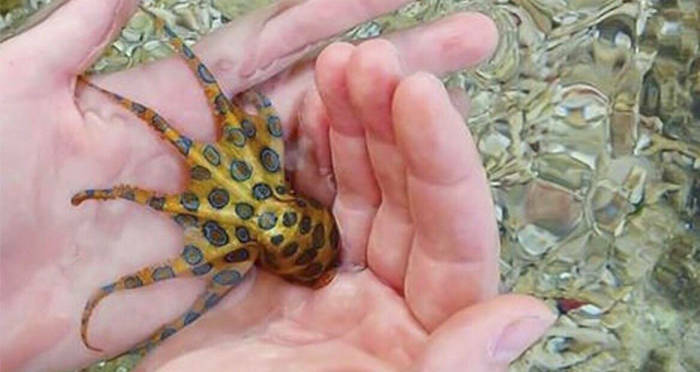 A tourist brazenly handles one of the most venomous octopuses in the world. Though poisoning by the animal can easily go unnoticed due to the relatively small sting, the unidentified man in the footage managed to escape his blissfully unaware brush with a flatline. Fortunately for him, the octopus didn’t seem threatened enough to defend itself. If it had, this footage may never have been uploaded in the first place. Remember, these things only secrete their deadly substance if they feel threatened, so stay clear — and if you live in Australia, try not to go swimming, will you? After this look at the impressively poisonous bite of blue-ringed octopus, read about the cool coconut octopus. Then, take a look at the blue dragon, the world’s most beautiful — and deadly — slug.